The Women in Business Luncheons are intended to deliver meaningful educational opportunities, while inspiring participants to courageously take what they've learned, back to their organization. 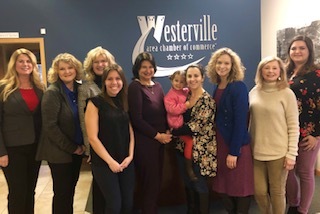 Westerville's Women in Business provides a trust-based learning environment within the Chamber. The goal of our events is to encourage members to share, learn and help each other succeed. Are you interested in promoting your business to over 1,000 women in the Westerville area? Advertising levels range from $1,200 - $125. Contact the Westerville Area Chamber at 614-882-8917 or email info@westervillechamber.com for details!